Cooked Sauteed Style Of Tenderloin Strip Steak, Fresh Onions, Fresh Bell Peppers along with our Secrete Blend of Spices and Topped with Our Famous Three Cheese Blend on a Fresh Baked French Bread Roll and Oven Baked to Perfection! And served with our Seasoned Tasty Wedge Potatoes. 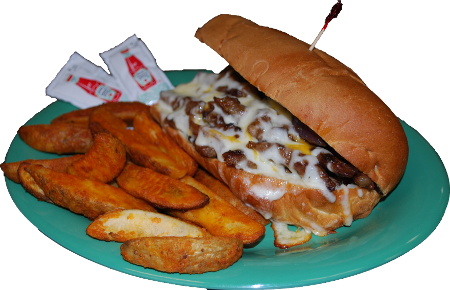 All Sandwiches Are Served On A French Steak Roll, Hot Or Cold And With Tasty Wedge Potatoes.